This fresh-tasting spinach soup is wonderfully nutritious and delicious. It's also surprisingly easy to make and can be ready in less than 30 minutes. That means it's perfect for a light lunch or a great start to a healthy dinner. When you make it, you will notice that the soup has a brilliant green color. That's because half of the spinach is reserved and blended into the soup after cooking. It's a great trick that also helps retain all of the nutrients found in fresh spinach. If you want to keep the soup vegetarian, simply choose vegetable broth over chicken. In a large saucepan or Dutch oven, heat the oil. Sauté the garlic, onion, celery, and potato for 5 minutes. Add chicken broth and fat-free milk. Bring to a boil, cover, and simmer for 10 minutes. Stir in half the spinach, cover, and simmer for 10 more minutes. Cool slightly, then transfer soup to a blender. Work in two batches, if necessary. Add the remaining spinach and blend until smooth. If you're working in two batches, use half the remaining spinach with each batch. 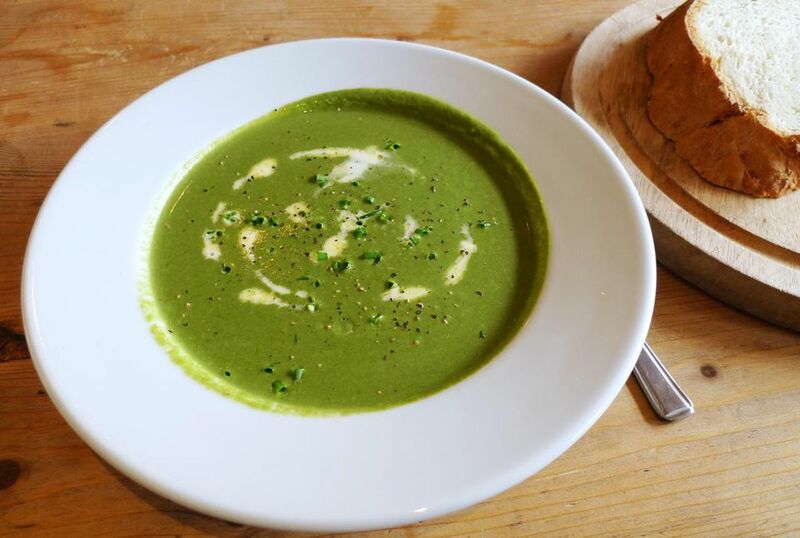 The lovely part about this spinach soup is that it's very versatile. It makes a warm and inviting soup for winter, but it can also be cool and invigorating, so it's perfect for summer as well. You can enjoy it for lunch with a simple salad or serve it with a complete dinner for the family. No matter when you eat it, you will find that this soup is even better when served with a crusty whole grain bread. Add a dollop of fat-free sour cream or plain yogurt to add a little dimension as well. For dinner entrees, consider lighter proteins like fish, chicken, or pork and either sauté or grill them. Keep the entire meal fresh and clean and everyone will love it.